I had an aha! moment in my art journey recently. I was watching a video tutorial by Sycra, an illustrator who posts art instruction videos on YouTube. Sycra was describing the difference between drawing what you see and understanding what you see. If you asked me if I knew that in order to create the illusion of a 3D form on flat paper that I had to be able to visualize the simplified 3D forms that make up that object, I would have nodded. Yes, of course I know that! Here's the aha! moment: I may have already known that, but it was while I was watching Sycra's video that I realized most of the time I wasn't actually doing it. I dream up paintings and art pieces in my head all the time. Lack of ideas hasn't been the problem, lately. When I'm out in the world and struck by the way the morning light hits a tree or the way intricate shadows play on the sidewalk, everything has potential. In my post on focused practice, I mentioned the struggle to get the beautiful scenes in my head or in front of my eyes out of imaginings and into physical reality in such a way that captures the moment and compels an emotional response in the people who see it. 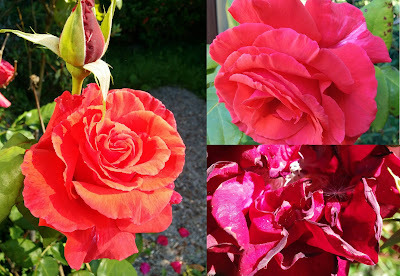 A red rose in bloom on the bush is not just red, it's also neon orange where the hot sun hits it, a translucent magenta where the light passes through the petals, and an inky merlot in the deep shadows where the petals meet and when it begins to wither and fade. There is a branching, almost fractal quality to the veining of each petal that is simultaneously a feat of engineering and the pulpy evidence of the biology of life. New abstract shapes are created in shadow every hour as the sun moves across the sky. 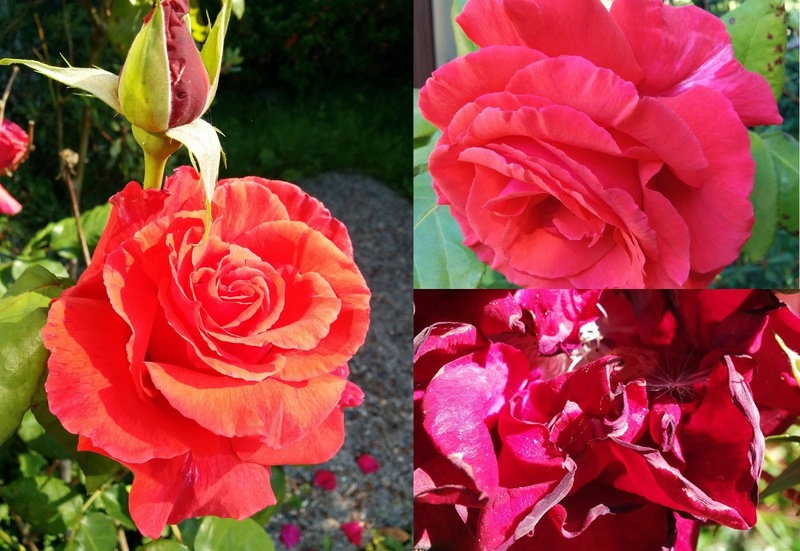 When you really stop and see the roses, there is so much to see. So many shapes, so many colors, so much detail. It's too complicated. It's too hard. Where would I even start? I tip straight into the Land of Overwhelm and that impulse to reach for my sketchbook gets squashed before my hand even gets the message to start moving. Oops, there's that inner critic again. OK, so some good news: I noticed that inner critic voice showing up. No really, noticing that is what's happening is much better than just listening to those doubts and fears and giving up before I've even begun, right? Why? Because now that I've noticed, I have the power to make a choice. I can listen to that voice or I can listen to a different one, one that gives reassurance and encouragement instead. Sometimes I call this alternate voice my inner goddess of infinite compassion, but here let's call her our inner coach for short. Alright inner coach, I'm ready for my pre-game pep talk! Skills are learned through study and improved through practice. To draw what I see I need to understand what I see. I need to simplify this complexity into generalized 3D forms. After I understand what I see, I can add the detail later. Here's my reference photo and my practice sketch. I started with a few overlapping circles and a small spiral at the center before feeling out the large shapes. I eliminated some of the innermost petals to simplify the flower. 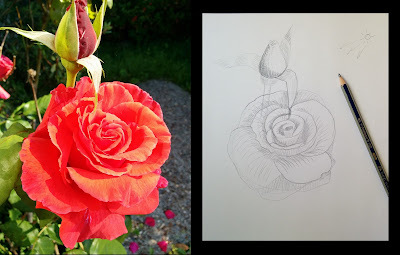 I used contour lines to force me to focus on the 3D forms of petal, leaf, stem, and bud. I indicated the direction of my light source to help me focus on what parts of the forms were facing the light and which were turned away or in shadow. This is just stage one. It's not a finished drawing, but I do feel more confident! Stay tuned for stage two where I take this understanding and begin to add the details to bring these roses to life.